The GPVWC International Touring Cup is the spiritual successor to the Gentlemen’s Racing Club Touring Car Championship. A conventional 15-minute qualifying session is followed by three short races and runs on every other Monday that the Career Ladder doesn’t feature. The series is aimed at those who enjoy more rugged team-based racing, and a wide variety of vehicles to choose from. Those who enjoy the elements of success ballast and a reverse grid (featuring in Race 3 of the evening) will also feel in their element. The 2016 International Touring Cup season will be the fourth running of the GPVWC International Touring Cup season. Eric Stranne entered the season as defending Drivers’ champion for the second year running whilst his own outfit, Ice Cold Racing, entered as the reigning Teams’ champions. STAX Racing decided to keep the All-Peruvian lineup with Diego Carranza and Carlos Andres Ladines for their inaugural season in the International Touring Cup. They also had talks with Nico Barclay to be their reserve driver and officially signed him after Round One. The first three races took place at Donington Park. Qualifying saw the two STAX Racing cars near the back of the grid, as Diego Carranza was unable to set a time and Carlos Andres Ladines qualified 24th with a gap of almost five seconds to the Pole sitter. Unfortunately, things didn’t improve much during the first race, and the STAX Racing cars crossed the line in P23 and P24. In Race Two, both drivers gambled and put on wet tyres, but a drying track meant that they struggled to challenge for points. In the end, Carlos Andres Ladines finished in P19 while Diego Carranza was classified in P22. In Race Three, both drivers were able to make up two places compared to their starting positions, but ultimately the team left Donington Park without points on the table. For Round Two at the Autódromo do Estoril, Nico Barclay substituted for Carlos Andres Ladines with very short notice. He qualified P12, while Diego Carranza started from P17. The team had high hopes to bounce back from the “pointless” opening round, however in the frantic first race they finished in P17 (Barclay) and P21 (Carranza), unable to score any points. With both drivers starting near the back of the grid, points would be hard to come by in race two. However, Nico Barclay had a race to remember, gaining 17 positions in an eleven lap race, finishing P7 and scoring the team’s first points in the International Touring Cup. Diego Carranza had to retire after he took a curb too aggressively and flipped the car. Connection problems meant that he did not start Race Three, while Nico Barclay scored more points by finishing in eight position. The next round at Tor Poznań saw the team struggling again. In the days before the race it became apparent that neither Diego Carranza nor Carlos Andres Ladines would be able to make it to the race because of work commitments. Since the team management was on vacation with limited access to the internet, it was unable to secure another substitute driver alongside Nico Barclay. This meant that for the first time ever, STAX Racing was unable to field two cars for a race. Nico himself reported issues with his internet connection prior to the Polish Touring Cup and had limited time to work on a setup, so expectations of scoring much needed points were low. Nico qualified in P15, starting in the midfield. Unfortunately, he had connection issues and, just as the race was about to start, he timed out. Race Two was a bit better, but not by much, as he timed out after driving 200 meters and right before the first corner. Subsequently, he decided against starting the third race. Before the next round at the Circuit de la Sarthe, Carlos Andres Ladines asked the team to find a replacement driver for him because he couldn’t guarantee that he would be able to start any races in the second half of the season. With Rob Mason, the team was able to acquire the service of a driver with a history of regularly scoring points in the 2016 Formula Challenge season for Epic Racing. Diego Carranza was working abroad, so Nico Barclay once again started for the team. Both drivers qualified in the midfield for Race One (Nico Barclay in P11, Rob Mason in P13). After a good start, Nico made contact with Niranjan Kumar, who flipped spectacularly. Nico fell back to P16 behind Rob, but finished the race in P11 because of some nice passes and some off-track moments of other drivers. Rob had some nice fights for position with Philip Morby, but crashed with James Wilson and had a major off. Nonetheless, he fought back and finished the race just outside the points in P16. In Race Two, Nico was in ninth position for most of the time, but a overtake in the last lap meant he would finish eight. Rob had a more action packed race, as he crashed heavily into the track barrier after making contact going into a corner three-wide with Adam Taylor and Mark Wicks. After that he found himself in 21st position, but fought hard to finish P17 in the end. The third and final race was action-packed for both drivers: In Lap two, Philip Morby closed the door on Nico, which, after a chain reaction, sent Tobias Olson into a spectacular half-spin. Nico was able to overtake James Wilson in Lap 10, gaining P6 momentarily. However, after a sub-optimal corner-exit, Nico got a tap on his car’s back, which sent him into the barriers hard. Nonetheless, Nico was able to finish in P10, which meant he finished all three races of the 2016 French Touring Cup in the points. 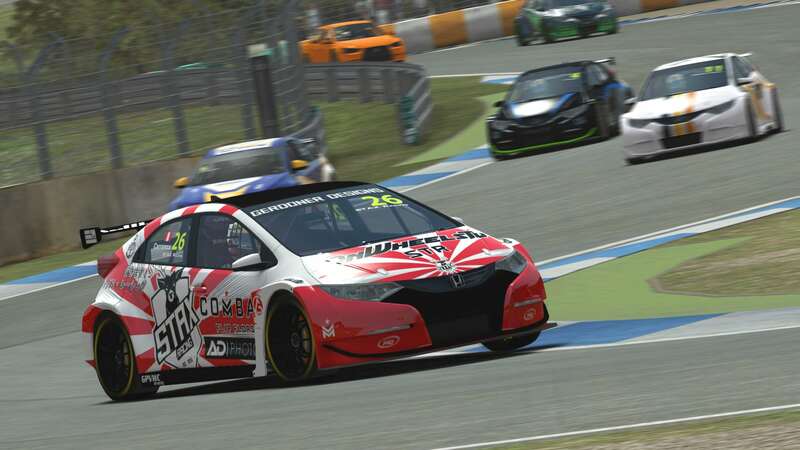 Rob Mason lost control while trying to avoid a crash in the first corner, finding himself in P20 after the first corner. After some thrilling battles with Ben Willis and Tuomas Koriala, he was in P14 momentarily. Koriala was able to pass Rob in Lap 7, and while Rob was able to follow him closely and put him under pressure, but was unable to make a move before the end of the race. Nevertheless, with Rob finishing in P15, both STAX Racing drivers scored points in a race for the first time this season. After penalties were applied, Rob was classified in P13 for both Race 1 and 2, which meant he scored even more championship points on his debut for STAX Racing. The penultimate round took place in Dubai at the Dubai Autodrome. Once again, the STAX Racing lineup consisted of Rob Mason and Nico Barclay, with both drivers starting from the the back of the grid because of penalties from the French Touring Cup. Nico Barclay started from P17 but gained a lot of places in the first lap. In Lap 5, he was in P10 already. After gaining another spot, he was able to close the gap to the cars in front of him, but the race ended before he could make any further moves. Rob Mason started from 19th position, but lost a lot of places in the first lap. After falling back to P22, he clawed himself back to P18 and was able to overtake Jacky Lotterman in the last corners, finishing in P17. In Race Two, Nico started from P9 and again gained some spots in the first few laps. He climbed as high as P5 until both Epic Racing cars were able to overtake him in Lap 9 and 11 respectively. In the end, he finished the race in P7. Rob started from P17 and also gained a few places in the first laps. He closed the gap to the driver in P15, but was unable to get into the points in this race. The third and last race saw Nico start in P5. He was able to gain two spots when he overtook Lewis McGlade in the first lap and James Wilson nearly flipped his car in the third lap. In the same lap, Nico overtook David Francic and was able to gain some space to the cars behind him. In the end, he finished the race in P2, the best result for STAX Racing in the 2016 International Touring Cup so far. However Rob Mason, starting in P16, had a race to forget. Lottermann, who was in front of him in the first lap, got carried out of a corner and rejoined the track without lifting, hitting Rob in the process. Rob crashed heavily into the barrier and found himself in last place. After flipping the car further into the lap, he drove into the pits to get his car repaired. However, he found the car nearly impossible to drive and, after flipping the car once more in the second lap, decided to retire the car. The last round of the season was held at Interlagos. Nico Barclay had a five-slots grid penalty and started 10th. In an exciting race, he was able to overtake drivers such as Sven de Vries and Niki Đaković to finish eighth. Rob Mason started in P8. He lost some places at the start, but was then able to follow Nico Barclay closely for much of the race. On Lap 6, he lost a place to Adam Hodgkinson, who flipped his cars a few turns later. In the final laps of the race, David Jundt was able to close the gap to Rob and put him under pressure, however he suffered a half-spin at the last corner, which meant that Rob finished Race One in P12. Race Two saw a close fight between Nico and the two Vod:Bul drivers. Nico was able to overtake Adam Taylor on the start-finish straight, almost scraping the pit wall. Then followed a thrilling three-way battle between him, Niki Đaković and Lewis McGlade. In the last lap, Nico was able to overtake Lewis, finishing P6. Rob Mason had a déjà vu, as Jundt was again on his tail for the last couple of laps. After many defensive manoeuvres, this time the Swiss driver was able to overtake him in the last lap. Rob finished this race in 12th position. Nico Barclay started the last race of the season from 5th position on the grid. However, David Francic suffered from a technical problem which meant he lost all steering input. As his car drifted onto the racing line, Nico Barclay made contact, sending him crashing into the wall. After another spin in the opening lap, Nico was forced to retire the car in the pits on Lap Two. Rob once again was close to Jundt in Race Three, and after some close fight with Adam Hodgkinson Rob finished the last race of the season in P8. All in all, it was a season of two halves for STAX Racing. After struggling in the first three races, where the team only finished in the points twice from 15 starts, the second half was a huge improvement. In 18 starts, the driver pairing Barclay / Mason only finished three times outside the points. In the end, STAX Racing was 10th in the Constructors’ championship table, just one point behind Origin Front Row Racing . All in all, it was a season of two halves for STAX Racing. After struggling in the first three races, where the team only finished in the points twice from 15 starts, the second half was a huge improvement. In 18 starts, the drivers pairing Barclay / Mason only finished three times outside the points. In the end, STAX Racing was 10th in the Constructors’ championship table, just one point behind Origin Front Row Racing.